This article is a compliment to “How To Clean Central A/C Condenser Unit Coils”. For the purpose of this article, we’ll be discussing air conditioner evaporator coil cleaning inside of the air handler of a split central air system, typical of air conditioning systems in the Dallas area. My central air conditioning system happens to contain a natural gas furnace for heating. Your air handler is composed of a blower motor, the furnace, and the evaporator coils. You can easily see which compartment your evaporator coils are located inside of by looking for the refrigerant lines and where they come out of the air handler. There are 2 refrigerant lines. One is larger and one is smaller. The larger one is low pressure and contains freon in it’s gas form. It will feel cold when your air conditioner is running. The smaller one is a high pressure, high temperature line that contains refrigerant in it’s liquid form. The above photo is from the other side, which clearly shows the evaporator coil compartment. There was a lot of foil tape around it from the last person who did a maintenance. First, turn the thermostat to the off position. You can also flip the switch located near your furnace to shut off power to your unit.You’ll need to locate the evaporator coils within your air handler. This will be the section where the freon lines enter. There is a sheet metal panel attached to the air handler which will need to be removed. It’s attached by sheet metal screws, and the edges are usually taped with foil tape to prevent too much cold air from escaping. Be careful not to damage your freon lines as you remove the panel. There were 13 screws all together to remove the side panel as well as open the top panel of the evaporator compartment of this unit. I had to open the top to access all of the coils. The side panel on this unit had to be rotated after removing the screws to clear the freon lines. Your evaporator coils should be visible and you should have enough room to clean the coils once the panel is removed. If your unit does not allow enough room to comfortably work, I recommend hiring a pro. At the least, you can visually inspect your coils once the panel is removed. Begin by spraying a foaming cleaner on both sides of the coils to loosen the dirt and grime. You can get a no-rinse foaming coil cleaner which will do the job just fine. I use WEB WCOIL Coil Cleaner on this unit and it works fine. An evaporator can remove many gallons of water from the air around it in a day! The condensation will more than rinse the coils. I always spray the coils with a mixture of bleach and water using a garden sprayer to help inhibit mold growth. About 1 cup of bleach to a gallon of water works very well. Never use acid based chemicals to clean your coils! Dust and dirt build-up on the inside of the coils. After spraying and carefully brushing the coils, I sprayed everything with a bleach/water mixture. You could use vinegar as an alternative, but the smell isn’t very pleasant and it is acidic. Either way though, clean your coils on a warm day so the condensate will help rinse everything when you’re done.. I use a garden sprayer filled with water and about a cup of beach to spray the coils after the foaming cleaner. I very carefully brushed all 4 sides of the evaporator coils with the brush shown, although a toilet bowl brush works very well too. Remember to be very, very careful when brushing the delicate fins of your evaporator coil. This photo was taken after spraying and rinsing the coils. You can see foam from the foaming spray cleaner floating in the bottom drain pan. This evaporator is original equipment in this house, which was built in 1994. Not too bad considering that it is highly unlikely that anyone has cleaned the coils in several years. When I feel the coils are well rinsed, I pour the remaining bleach/water mixture I have left in my garden sprayer into the drain lines to keep them free of algae buildup. A clogged drain line can cause your drain pan to overflow and cause extensive ceiling water damage (unless you have a cutoff mechanism,. which is “to code” in most places now). The house will have a very mild bleach aroma for about a day. Unless you are sensitive to it, there is no real concern, it is a very mild smell that dissipates fairly quickly. When you are done, replace the panel, screws and use foil tape to seal the edges of the panel. Panel replaced, edges taped and feel along all sides to be sure there are no cold drafts escaping from the unit! 1. When your air handler is open you can look inside and do a visual inspection of the amount of rust, grime and mold accumulated on the evaporator coils. Also check the pan for rust and holes. Perhaps the best pan to have is a plastic drain pan, which are available. Hire a pro to replace the pan or coils when needed. There should also be a secondary pan under the air handler equipped with a cutoff switch in case the evaporator drain pan fails. 2. 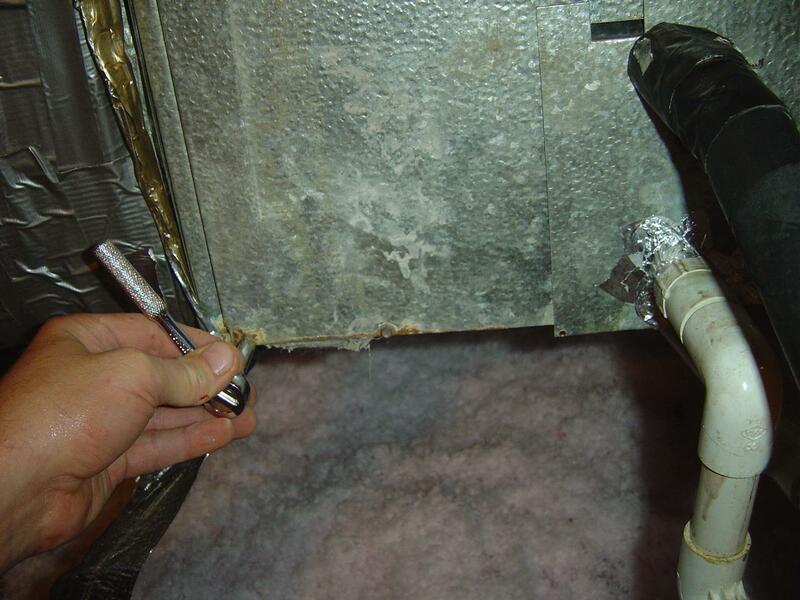 Air conditioner evaporator coil cleaning should be performed twice yearly. Once in the spring before the cooling season and once in the fall before the heating season. Good maintenance will save you money every month on your utility bill and keep you from replacing major parts on your system prematurely. Heating and cooling your home is the single highest expense most homeowners have on a month-to-month basis. 3. Air conditioner evaporator coil cleaning is not a difficult job! Take your time and do a good job and expect to spend an hour or more your first time through. As you gain confidence and experience you’ll get faster. And you’ll always know how the internal parts of your air conditioner are doing. 4. Hire a reputable HVAC Contractor to inspect your entire system before buying your next house; you will know what to expect out of your heating and cooling system going into your new home. They can usually tell you how old your heating and cooling systems are, and how much life is left in them. Most home inspectors check the operation of your heating and air conditioning system but many do not open air handlers or report their true condition. The cost of an HVAC specific inspection could save you thousands of dollars alone. Air conditioner problems are rarely inexpensive to fix. 5. Clean and inspect: While your panel is off to the evaporator, use a Good Quality Shop Vac for some of the areas to vacuum out dust. Extensions can help you get pretty far into the duct work, and it can make a huge difference. Look for rust and leaks on the drain pan. A failed drain pan can possibly cause your system to shut down and may cause extensive ceiling damage. Be sure you change your system filter every thirty days. It’s located in your air handler in front of your blower or behind the return vent inside your home. You can hire a handyman to clean your coils for you for less than a full service call from an A/C pro, but a handyman cannot check freon levels or add freon. So there you go. Pretty much all there is to typical A/C evaporator coil cleaning. Feel free to send in your comments, click a social button so your friends can check it out too, and good luck!